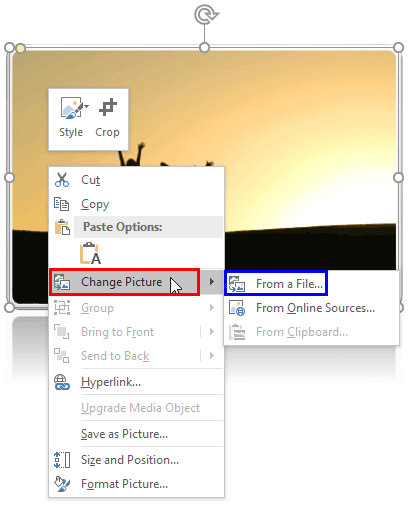 Imagine you have inserted a picture in PowerPoint, and then applied various picture editing options to enhance its appearance that includes applying a border, some Picture Effects, etc. Next, you also added a couple of animations such as Fade and Zoom, synced them to happen together, and also timed the animations to occur at a particular speed. And then you realize that you have a better picture, or your boss asked you to change the existing picture to another one, but with all the same effects and animations! You would probably delete the original picture and start all over again, and yes, that is a long process! Or you can change any existing picture into another with just a couple of clicks, retaining all effects and animations.